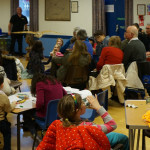 Everyone, whether an expert or an amateur, is eligible to enter. There are classes for daffodils, tulips, cacti and all sorts of plants. There are also plenty of non-horticultural classes – the Home Produce Section includes a loaf of white bread, a savoury flan, scones, jam, wine and lots more. 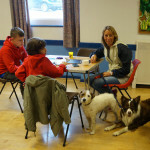 There are special classes for club members, novices and children. Contact Show Secretary, Peter Trickett, on 01924 373829 for a Show Schedule. 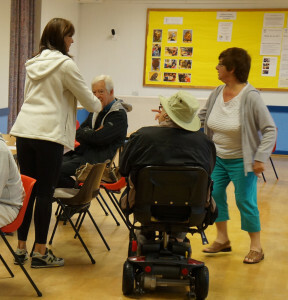 Schedules are also available from Wrenthorpe Village Hall, Valley Crescent Centre, and Wrenthorpe Post Office. WAKEFIELD HOSPICE SPRING FAIR: The local Fund-Raising Group will be holding a Spring Fair in Wrenthorpe Village Hall TOMORROW, Saturday 16 March, from 10am – 1pm. There will be quality craft stalls as well as stalls selling cakes, plants, bric-a-brac, books and jigsaws, a raffle and tombolas. 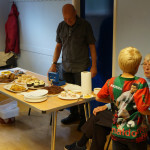 Refreshments, including bacon butties will be on sale. Admission FREE but donations gratefully received. 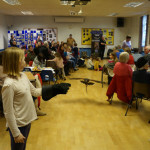 WRENS AGM: Wednesday, 20 March, 7.30pm in Wrenthorpe Village Hall. 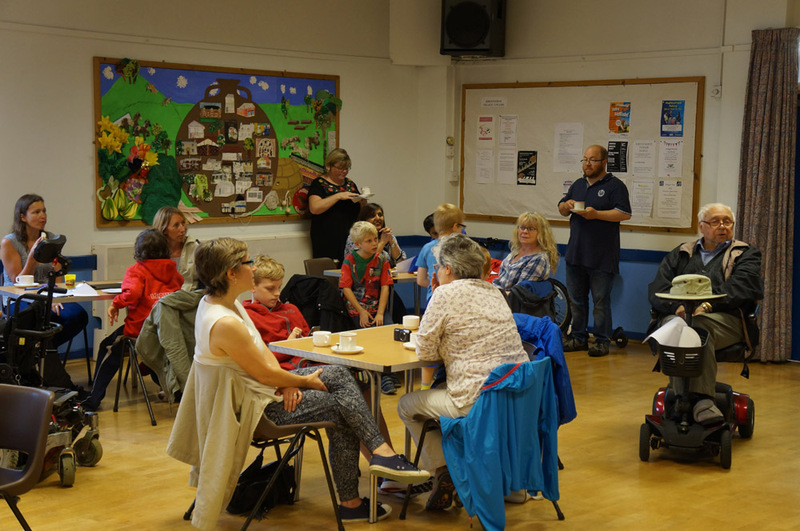 Short meeting followed by drinks and nibbles with Speaker, David Leyshon, a retired college lecturer who will be giving a talk on the life, career and achievements of John Harrison. 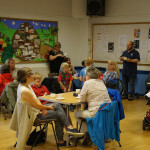 OUR GREEN BELT IS SAFE – LET’S PARTY!! Thursday 21st February was the last date for comment on Local Development Plan proposals to use green belt land for housing. 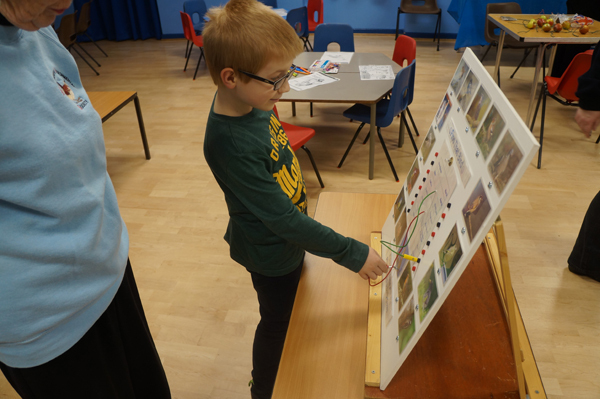 We’ve confirmed that the Council did not allow the developers’ original proposals and no new proposals have been submitted for Wrenthorpe! 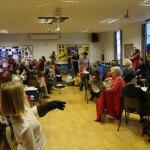 That’s wonderful news, and it’s time to party!! 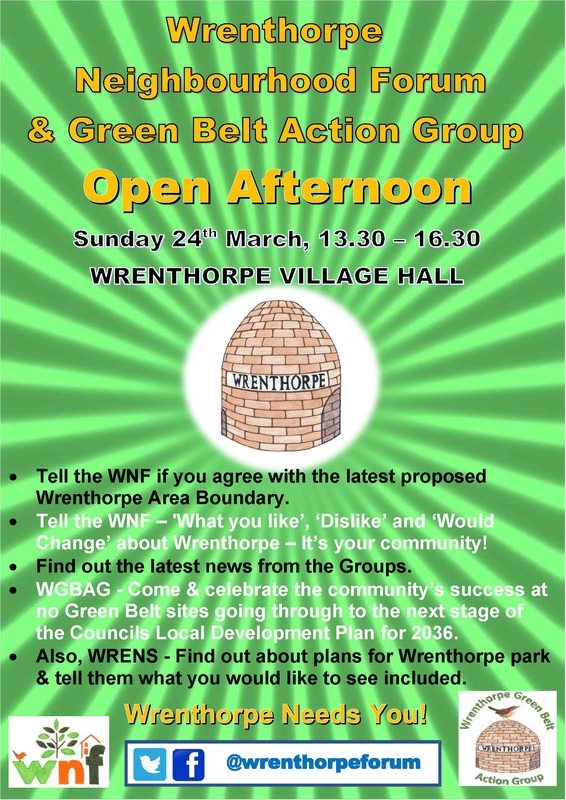 So, you’re all invited to the Neighbourhood Forum in the Village Hall on Sunday 24 March, 1.30 to 4.30; but it will also be a Green (Belt) Party. Wear something Green! 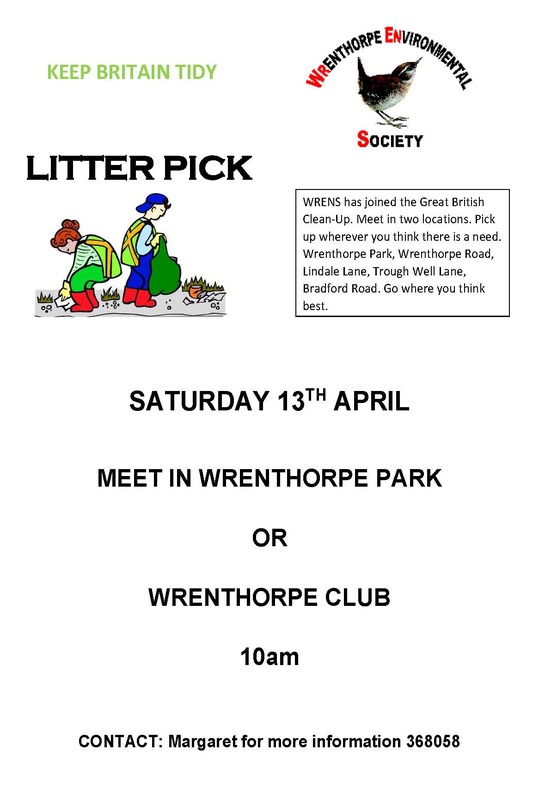 Bring your own drinks and nibbles: Celebrate Wrenthorpe’s green fields! 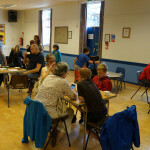 COMPUTER CLUB: The Club meets once a month, usually on the last Thursday of the month, from 7pm until 9pm at Valley Crescent Centre, Wrenthorpe. 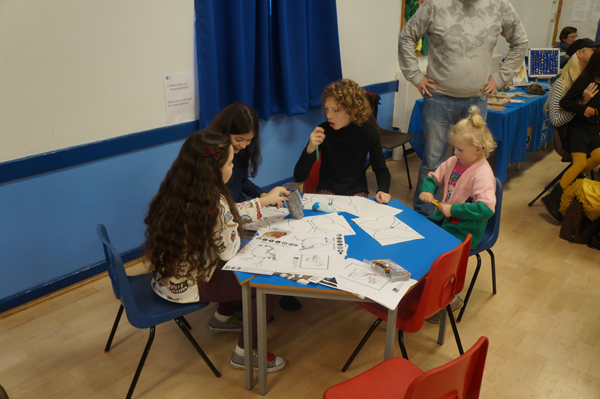 Each session costs £3 which includes internet access. 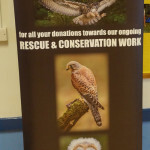 Ring Darren Welldon 07783 171 248 for more information. 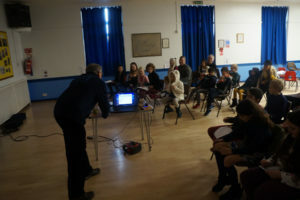 The next meeting is on Thursday, 28 March. 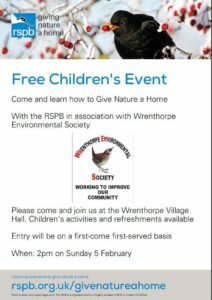 Wrens first event of 2017 was held on Sunday 5 February 2017 in Wrenthorpe Village Hall. 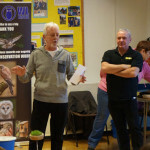 Lesley and David Tompkins, together with Mick Hall came along to talk about wildlife in general and particularly birds. 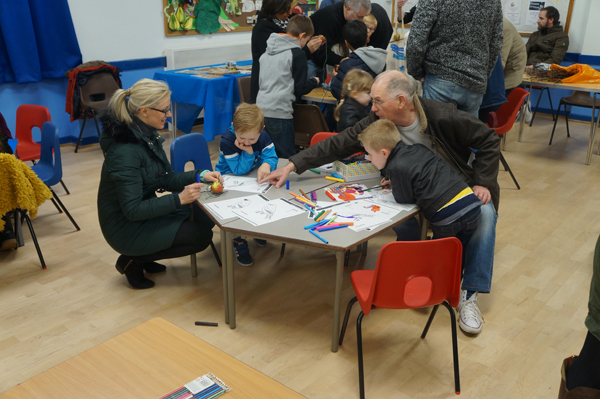 After a brief talk by David the children had the opportunity to take part in a number of activities including games and making a bird feeder. 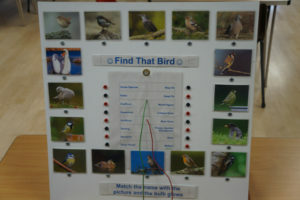 Click on any of the pictures in the gallery below to see a larger picture. 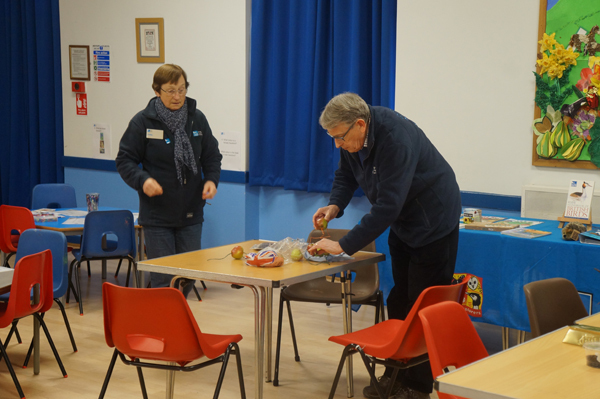 By far the most popular activity was making a bird feeder from an apple, twigs and sunflower seeds from material prepared by Lesley and David. Another popular activity was matching a bird with its name on a very ingeniously designed board where when a plug was inserted into the name socket and a metal disk was touched with a lead, a bulb lit up. 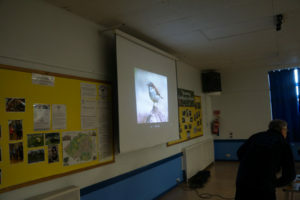 Towards the end of the event David gave a slide show of birds that the children would probably be able to recognise and then played, in a different order, their bird song which the children were asked to identify. 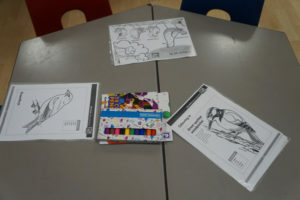 This was a good start to the year and the children enjoyed it. 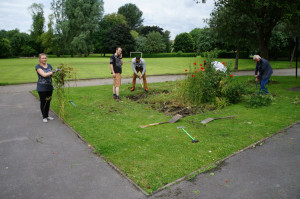 As Wakefield Council can no longer afford to provide and maintain formal planted beds in the parks and open spaces for which it is responsible, a number of volunteer groups and societies have undertaken the task of doing so over a wide area. 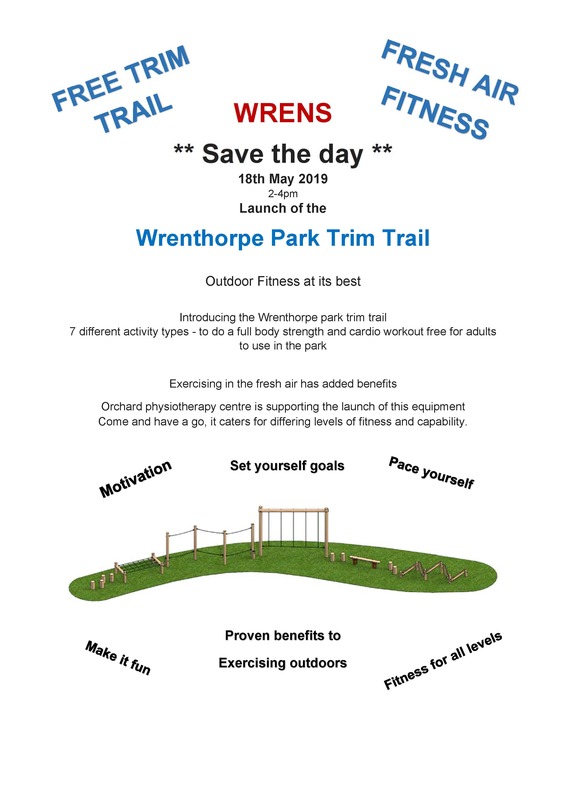 WRENS have newly adopted four beds in Wrenthorpe Park adjacent to the one which was planted a few years ago with the letters WRENS in box within a planting of lavender. 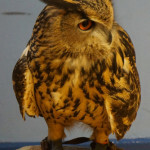 These are immediately outside the entrance to the bowling green. Work started today 30 June 2016 on clearing these weedy beds with the welcome help from a team of volunteers from the Nationwide Building Society (see pictures below and click on them to expand) under the guidance of WRENS Vice-Chairman Charles (don’t call me Titchmarsh) Cantillon. Bed 1 – To contain only English wildflowers. 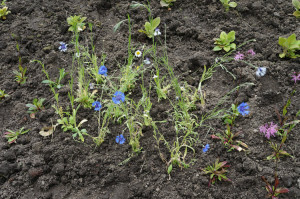 Although many consider such plants are not ideal for formal beds, with an untidy look, they are certainly attractive to the bees, butterflies and other insects. 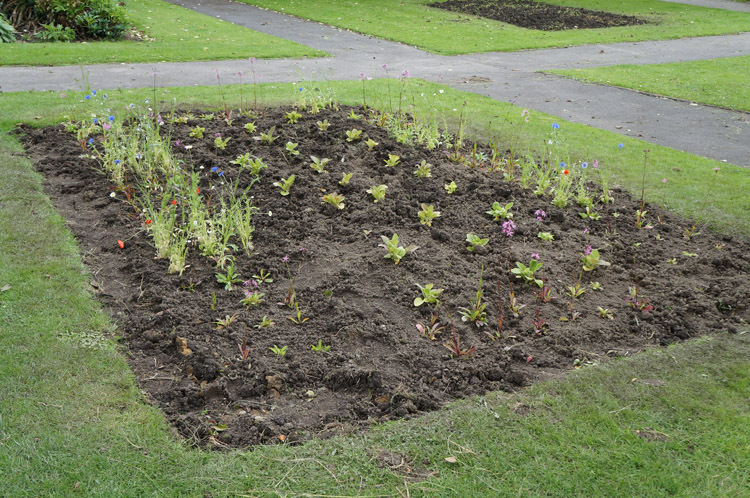 Although we are rather late in the season we have today planted this bed with foxgloves ( a biennial which will flower in 2017 and self seed), ragged robin and a mixture of cornflowers, poppies and daisies. 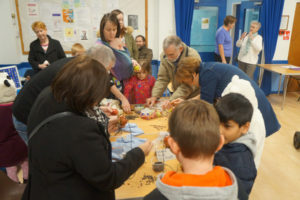 A more comprehensive planting will take place in the Spring of next year. Bed 2 – This will be planted next week with summer bedding plants including French Marigolds, Blue Lobelia, White Alyssum, Begonias, Verbena Bonariensis and Geraniums. 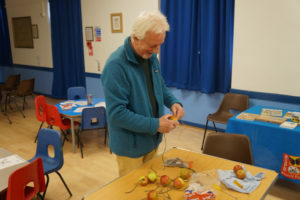 When these have completed flowering in the Autumn then they will be removed and a planting of May flowering Tulips will be made to be replaced in June 2017 again with summer bedding plants. 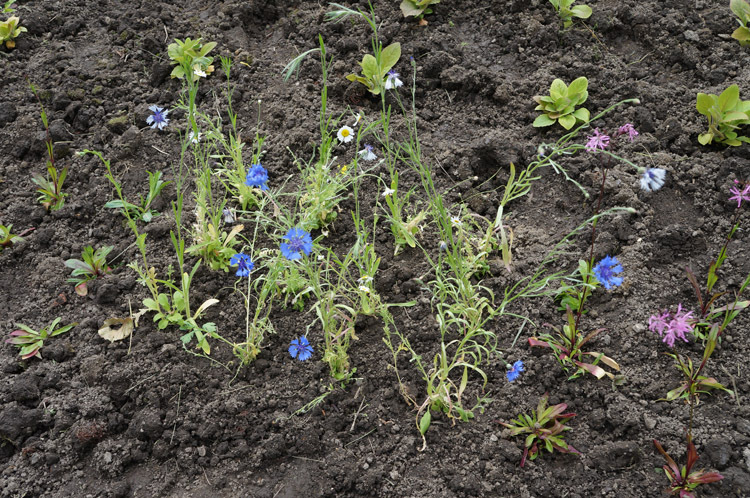 Bed 3 – (Subject to cost) A Perennial bed possibly Roses inter-planted with Lilies. 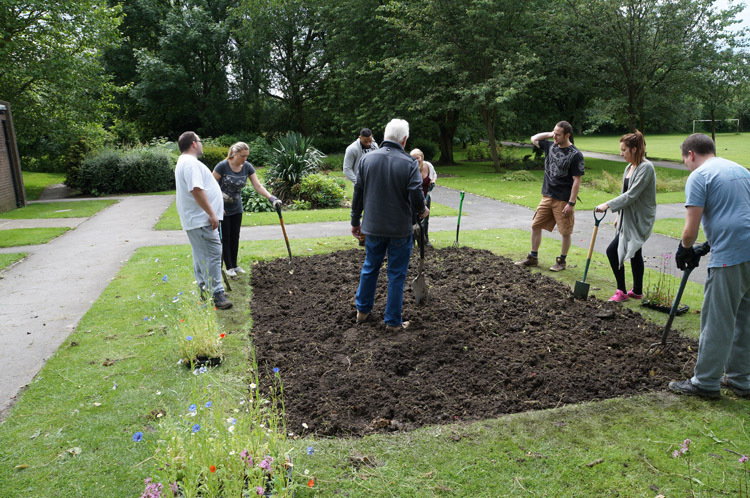 Bed 4 – A bed entirely planted with herbs both popular and less well-known. It is hoped that it will be possible for the general public to pick (sparingly) from this bed and a guide to the herbs planted, together with their use, will also be on display. 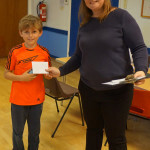 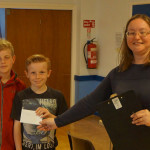 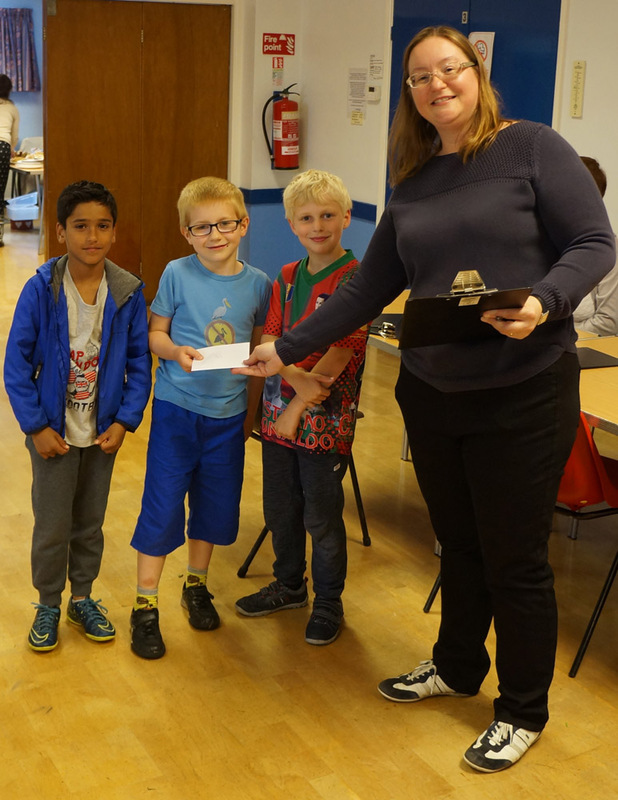 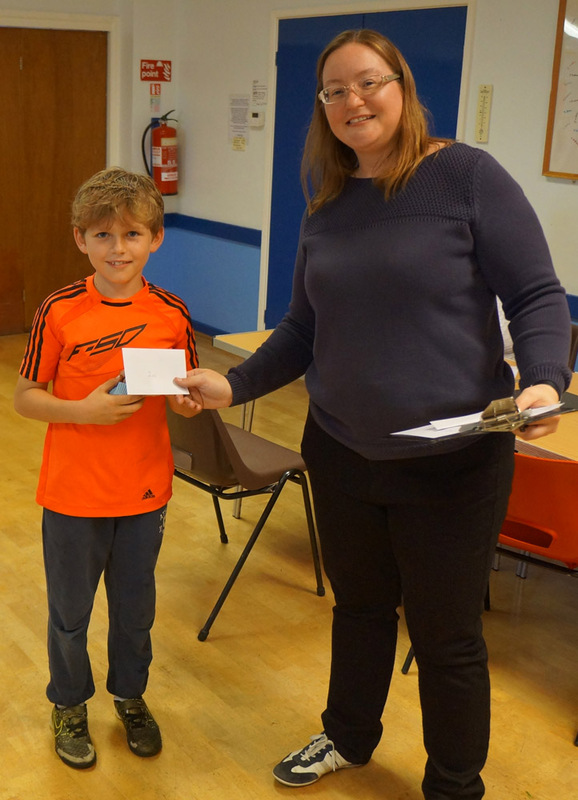 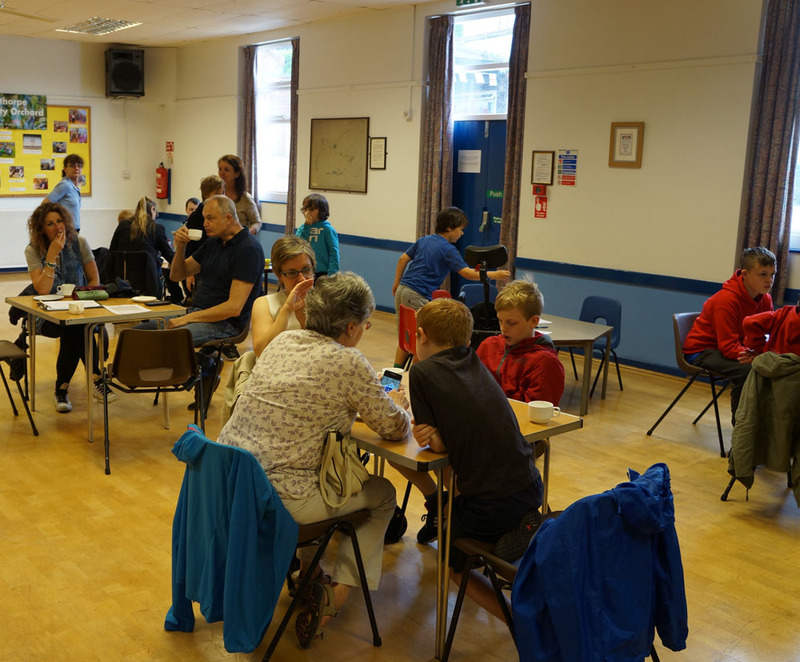 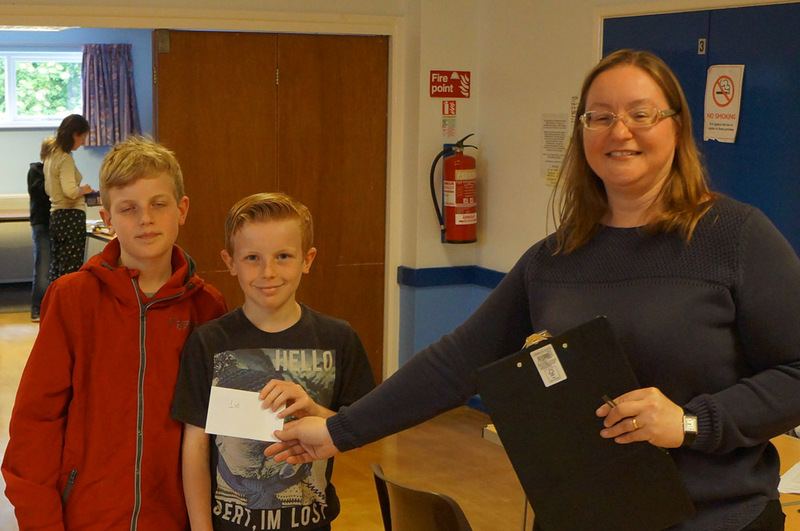 Despite the weather being rather wet, Wrens Treasure Hunt 2016 was quite successful with 9 teams, 33 participants and a dozen judges, committee members and other helpers. 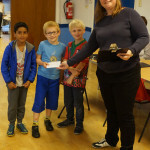 After an anti-rain dance (well it looked like one) from three of the judges and our President the competitors were sent on their way and told to return in less than an hour. 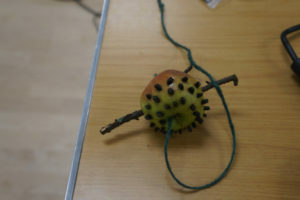 The aim was to identify somewhere in Wrenthorpe 30 items, photograph the item with their numbered lollipop stick also in shot and record on their sheet the number of the photo taken with their phone or digital camera. 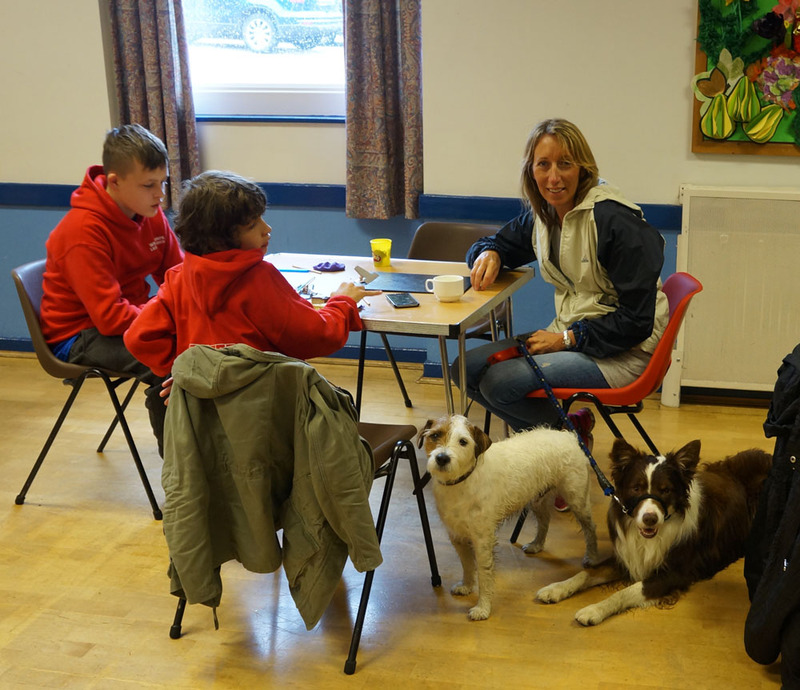 Meanwhile the judges waited patiently for their return. 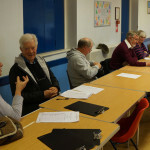 On arrival a judge was allocated and one member of the team was then required to locate the photo for each of the items on the sheet and satisfy the judge that, for example, the dot in the sky was in fact the pigeon, or dove, that was required. 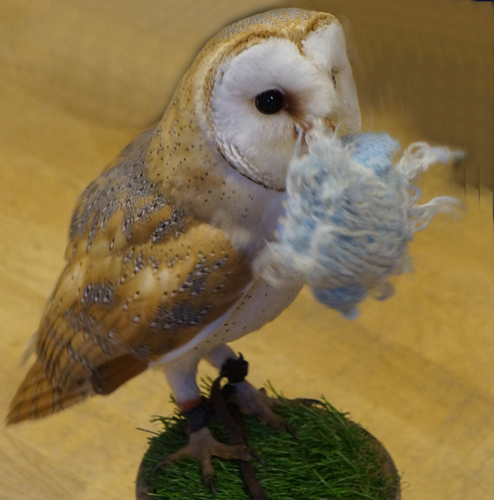 That’s the only item we are giving away so that we can use most of the items again next year. 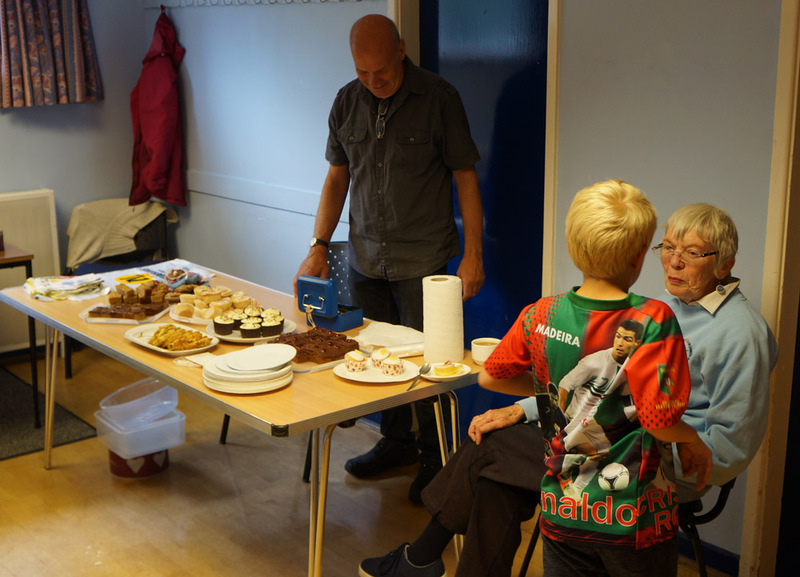 Meanwhile the rest of the team tucked into the refreshments that were available. 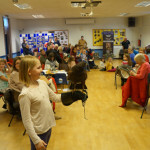 A selection of photos follow, click on the image to increase its size. 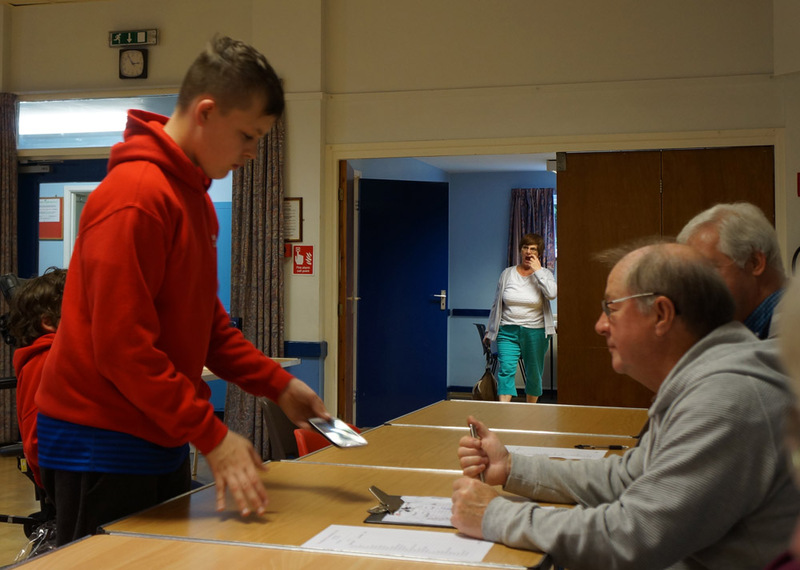 In the end the result was a very close thing. 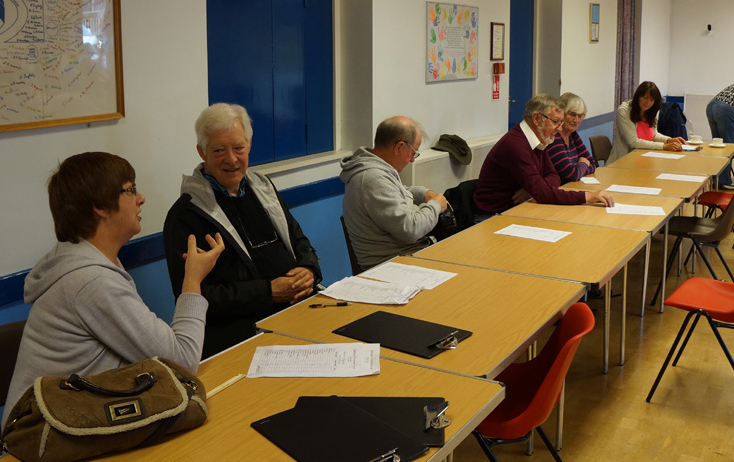 The Annual General Meeting (AGM) of Wrens will be held on Wednesday 23 March 2016 in Wrenthorpe Village Hall commencing at 7:30pm. 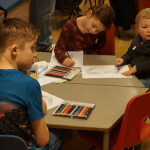 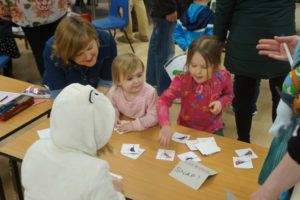 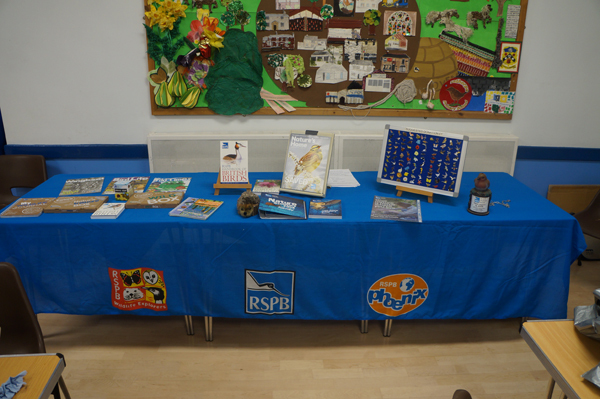 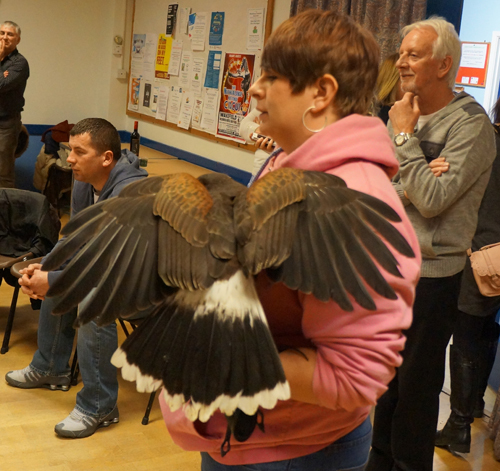 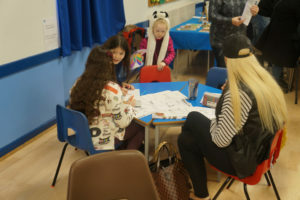 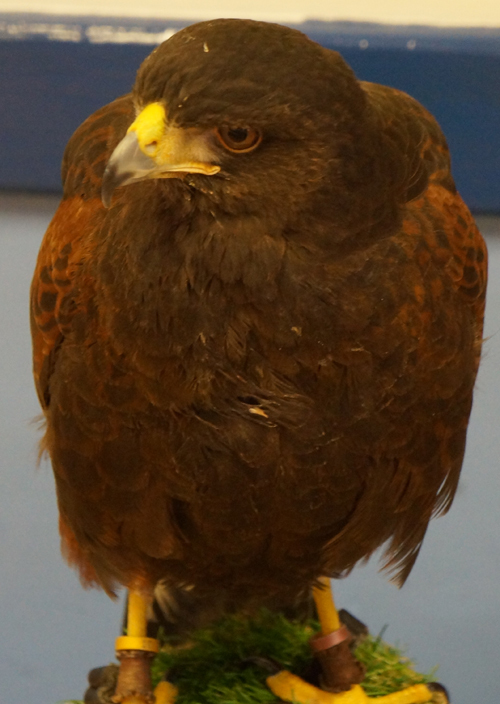 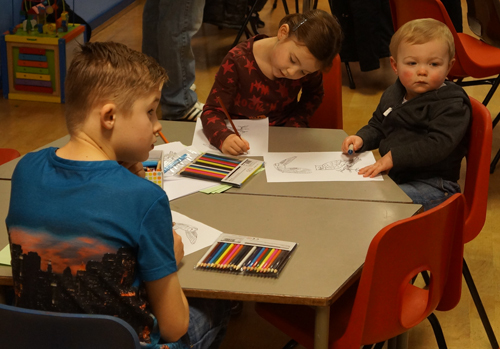 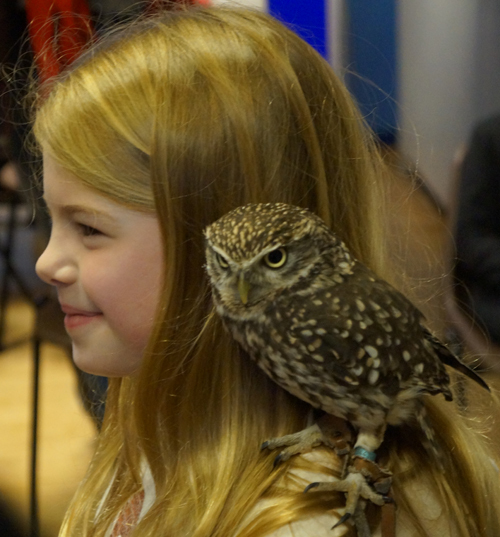 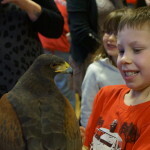 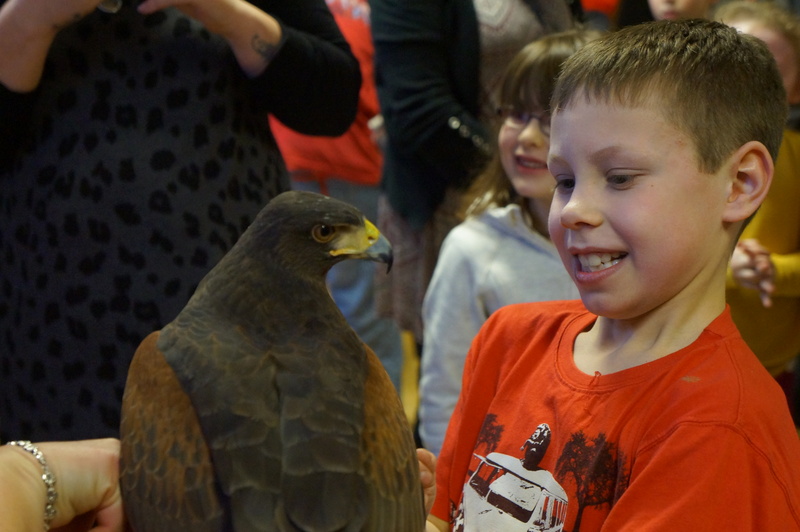 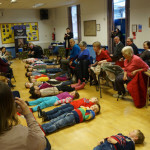 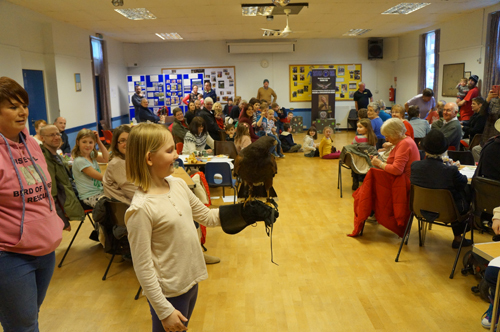 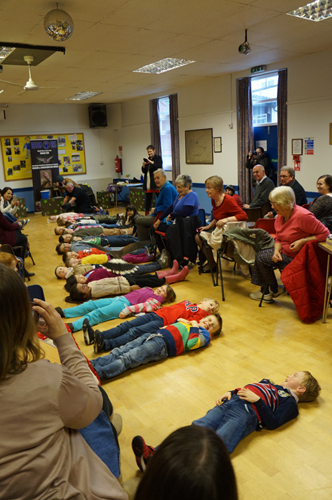 WRENS held their first event of 2016 on Sunday at Wrenthorpe Village Hall which was filled to capacity by lots of children with adults to see a presentation by the Wise Owl Birds of Prey display team. 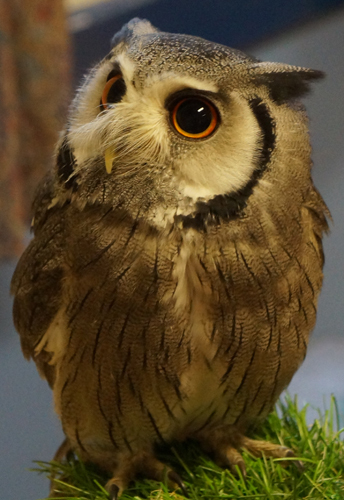 Click on any thumbnail to increase its size. In his opening remarks, Chair for the event Charles Cantillon briefly outlined the aims of WRENS to develop interest in the environment within the local community together with a general outline of the programme for the afternoon. 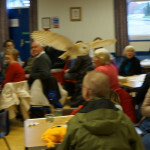 The audience was encouraged to make donations at this free event all of which would be to support the preservation costs of Wise Owls. 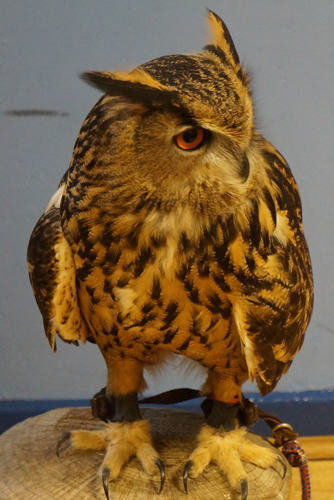 The stage was then left open for Wise Owls to fill in the details, and they began by introducing the five birds that they had brought along. 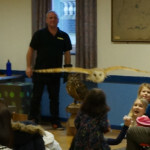 followed by the barn owl and Harris Hawk.The owls drew admiring gasps from the audience; the hawk however looked less impressive apart from its size. 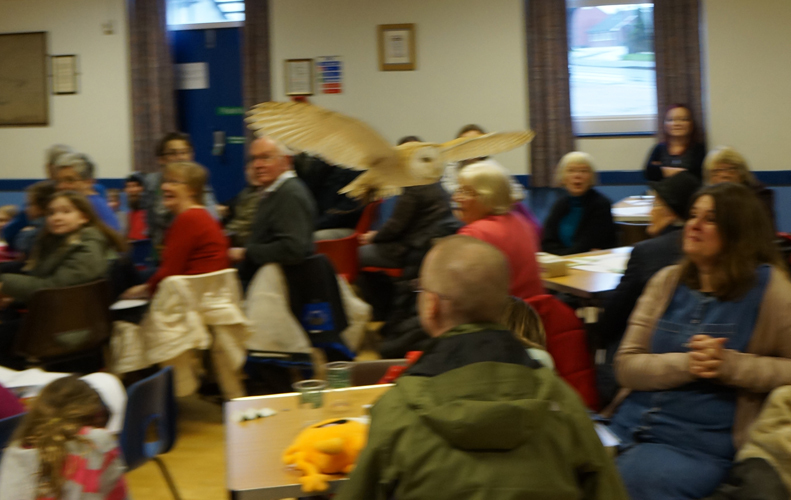 That is until it opened its wings and its tail. 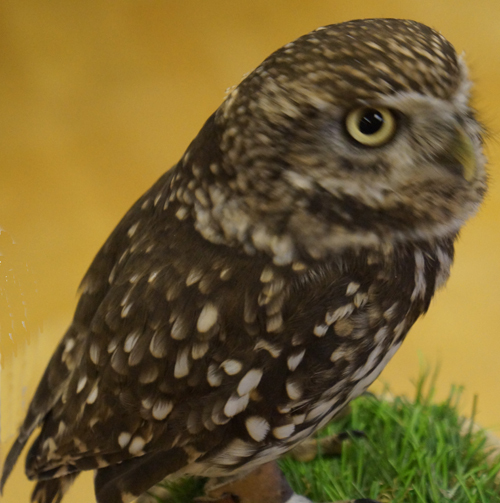 Wise Owls then held an informative discussion with the children present on facts about owls before an interval for coffee, tea and buns. 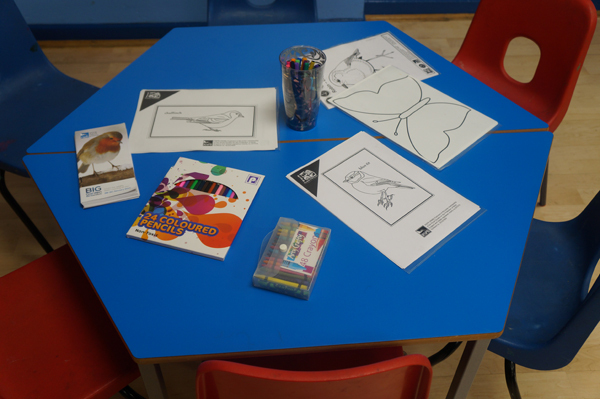 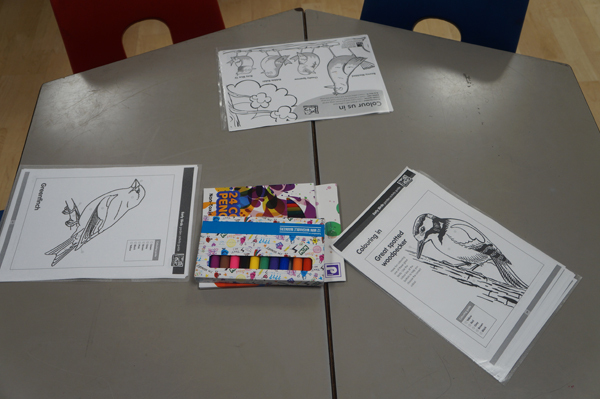 Pictures of the birds were available on small tables with colouring pencils and crayons. 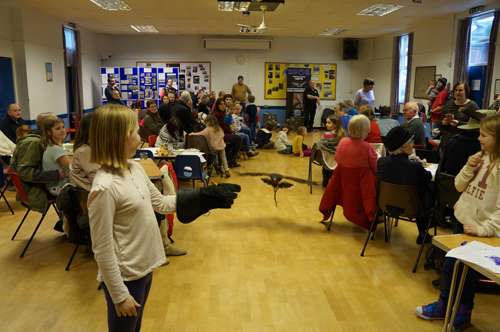 After the short break and the drawing of the raffle we were entertained by a wonderful flying display of the full length of the hall. 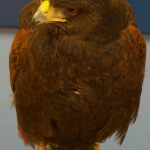 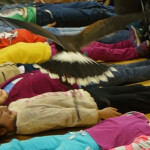 Birds in flight are difficult to photograph at the best of times; indoors in a crowded environment it is almost impossible. There were some impressive telescopic lenses in the hall so if you have any better pictures we would be pleased to include them. 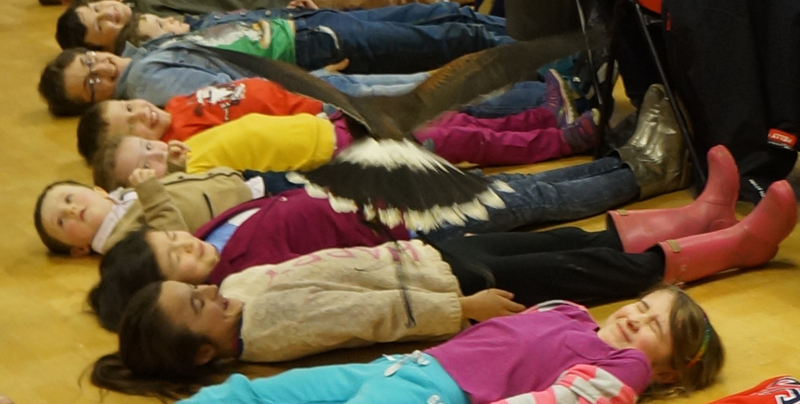 The scariest part came when the bravest children were encouraged to lie perfectly still and absolutely flat on the ground while the hawk flew close above their bodies. 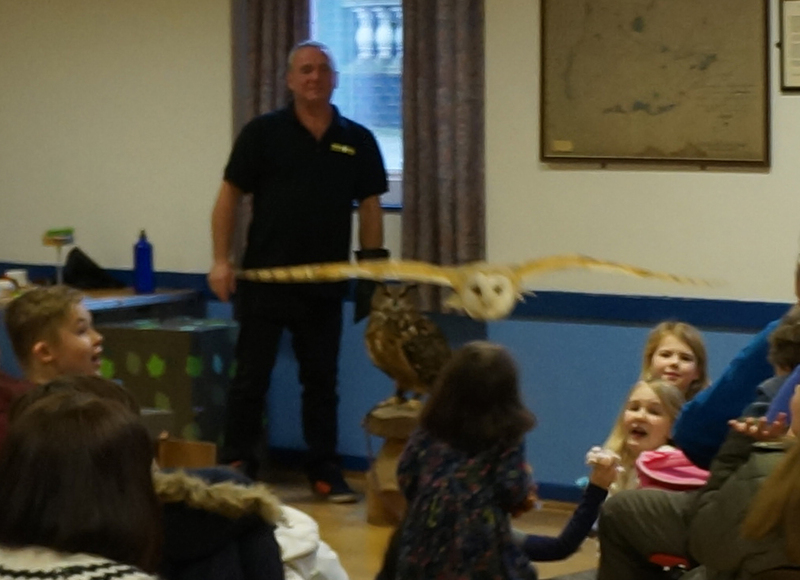 The small owl and barn owl also took part in the flying display. 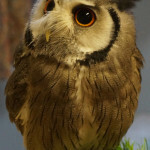 Unfortunately the small owl was too small to photograph in flight and the barn owl blotted its copybook on one occasion by landing on the cameraman. 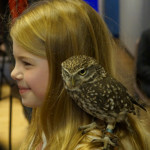 Finally Wise Owls encouraged all the children to come and be photographed holding the birds. 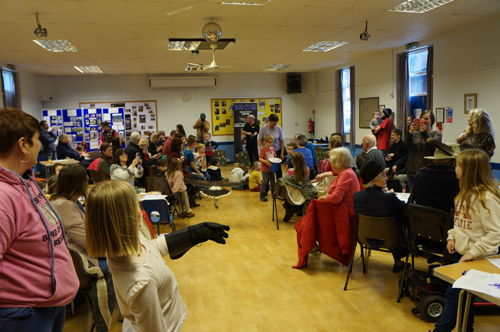 A wonderful afternoon enjoyed by all. 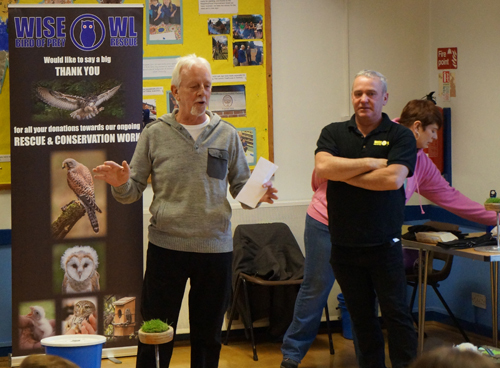 Many thanks to Wise Owl and WRENS volunteers for their efforts. 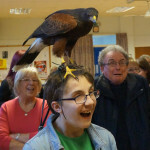 Please feel free to add comments.